The Truckee River is the only outlet from Lake Tahoe. Snow pack on the High Sierras, principally at the southern end of Lake Tahoe, melts and flows into the lake via the Upper Truckee River beginning way up somewhere around Carson Pass. At Tahoe City, the waters of Lake Tahoe flow into the Truckee River which flows west to the town of Truckee, then east through Reno, Nevada, and then north to the southern end of Pyramid Lake. At the head of the river is the Lake Tahoe Dam with its 17 sluice gates. Back in the very early 1900's, a gatekeeper, or water master, lived at the river's source, charged with managing the flow of water over the dam. The reconstructed gatekeeper's cabin is now a museum housing artifacts from the history of Lake Tahoe. A wonderful collection of Native American baskets representing over 80 different tribes. The Truckee River is a great place to fish, ride a raft down the rapids, or do some casual sightseeing, all depending on which length of the river you happen to be on at the time. Tourists are gleefully informed of the famed "fanny bridge" or "rump row" which is revealed by sightseers leaning over to look at the river below. So what kind of fish can you hope to catch in the river? Lehonatan trout seem to be the holy grail of Truckee fishermen, with 20-lb. monsters being common in prehistoric times. Ah, but no more. Today hunters will find the formidable Brown and Rainbow trout to be heavily represented and more numerous. Nevertheless, experienced fly fishermen know that these underwater predators have little interest in becoming your prey and are not easily outwitted. White water rafting? On the Truckee River? You bet! The river has Class I through Class IV stretches. 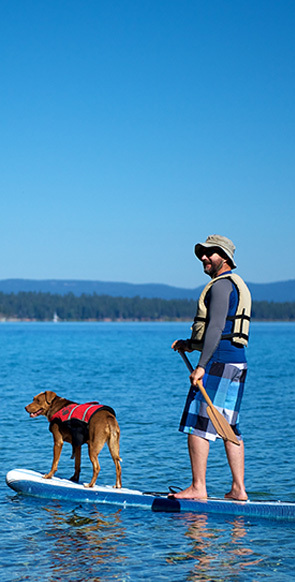 Beginners and casual sightseers will enjoy the stretch from the Lake Tahoe dam to River Ranch. Just beyond Boca Reservoir, when the Truckee and Little Truckee rivers merge, is where the real fun begins. Class II, III, and IV, rapids are present until rafters reach Floriston. After that rafters will enjoy the ride into Reno. Downtown Reno, Nevada, has constructed a whitewater park on the Truckee that runs right through the Arts District with its galleries of painting, sculpture, pottery, and furniture. Boutique shops, coffee houses, cafes, and nightlife are all found on the Riverwalk. Extending for half a mile with six drop pools in the south channel and five in the north channel, the park, a kayaker's playground, flows around Wingfield Park, on an island, with facilities for concerts and picnics. The Truckee River, then, continues on its way to the southern end of Pyramid Lake. But that's a subject for another day.